Cosy Beach View is located at a decent location (Pratumnak hill). Construction of Cosy Beach View was completed in 2013. 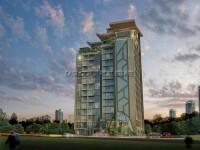 Condominium comprises of 4 buildings, having 24 floors and includes 256 units. This 50 s.q.m one bedroom has all in one that fits with your needs! Comes with fully furnished, fitted European kitchen, and a stunning city view. Now available for sale and for rent in a valuable offer. Facilities at Cosy Beach View include elevator, parking, 24-hours security, cctv, swimming pool, sauna, gym, garden / BBQ area.